August | 2015 | love lives on. I don’t talk a lot about Jake’s spine/walking issues. The progression from good to bad, for the most part, has been slow and steady, so it’s given him time to learn to acclimate. Every once in a while I’ll find a video of him from the early days of him living here and recall just how mobile and fast he used to be. 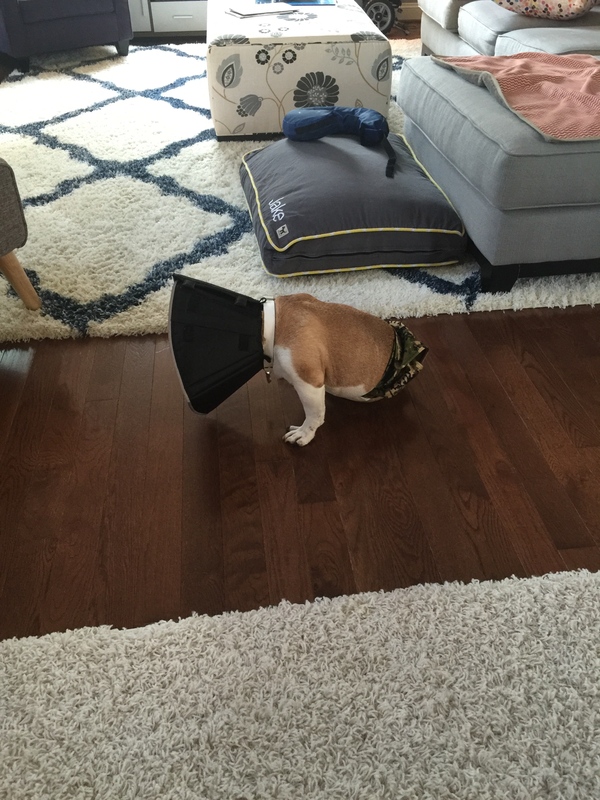 The cone is a pain, for sure. 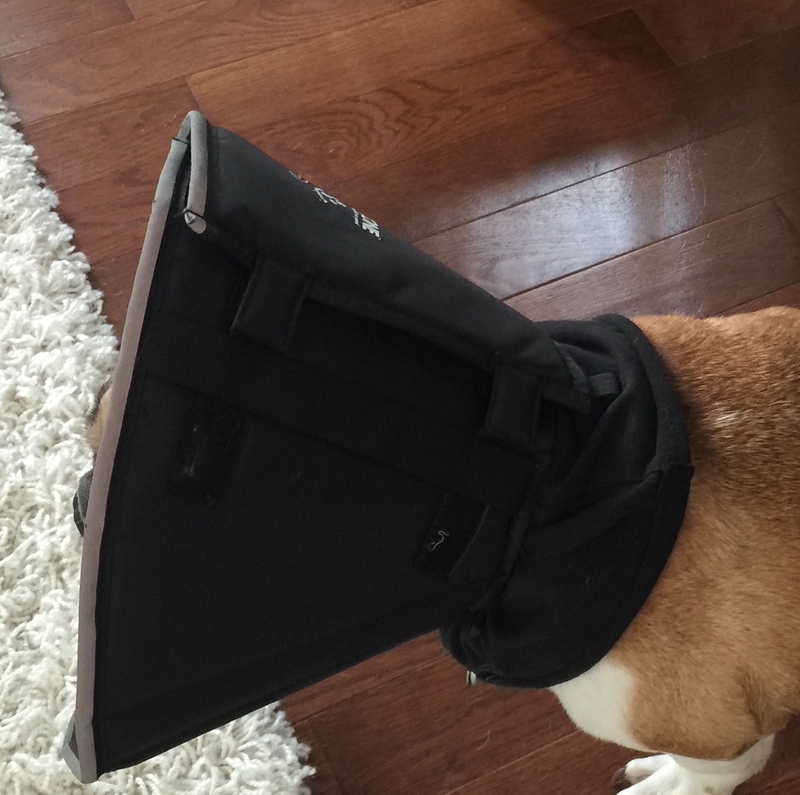 There is no dog who has ever worn a cone and loved it and there is no owner that has had a dog in a cone that hasn’t thought ‘do we really need to use that thing’. 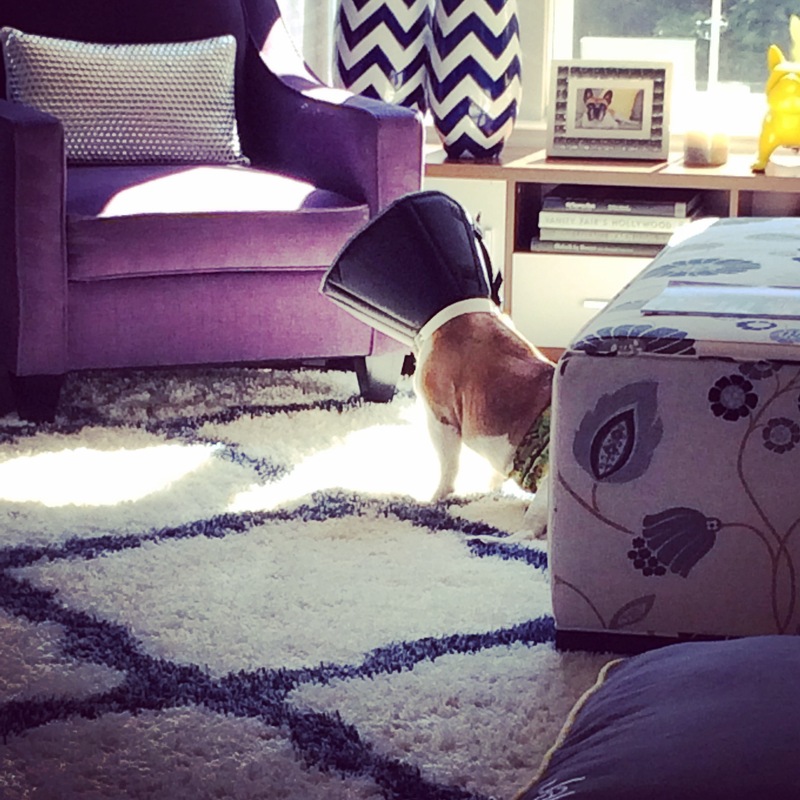 Jake is on week 4 of the cone (24/7). We have to protect his eye. But in doing so, it has become apparent that it was at the mercy of his spine and legs. 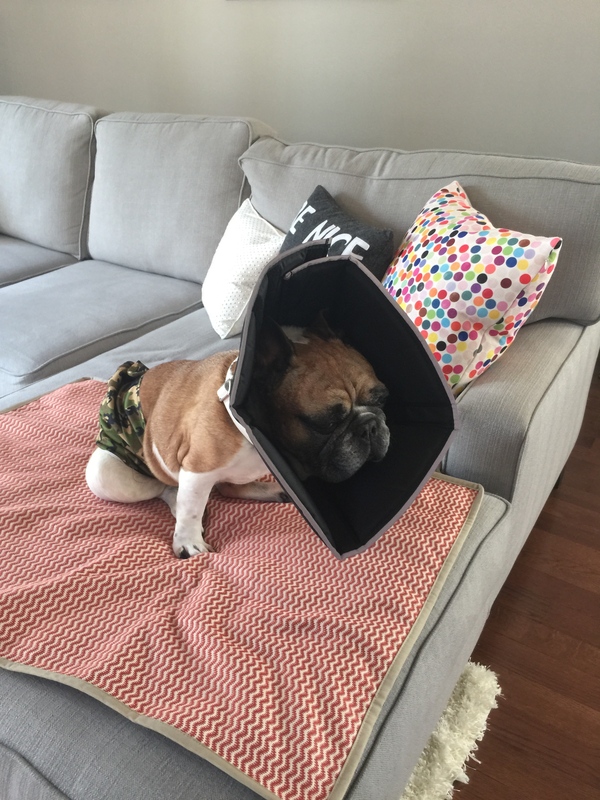 It’s not just holding the cone up, it’s the posture he’s forced into while wearing it. His leg function has decreased. A lot. If you asked me if I would rather he see or keep leg function as long as possible, I don’t know what my answer would be. I hate finding out there has been a trade-off but the reality is, his legs were always going to decline so I guess protecting the eye was the right thing to do. 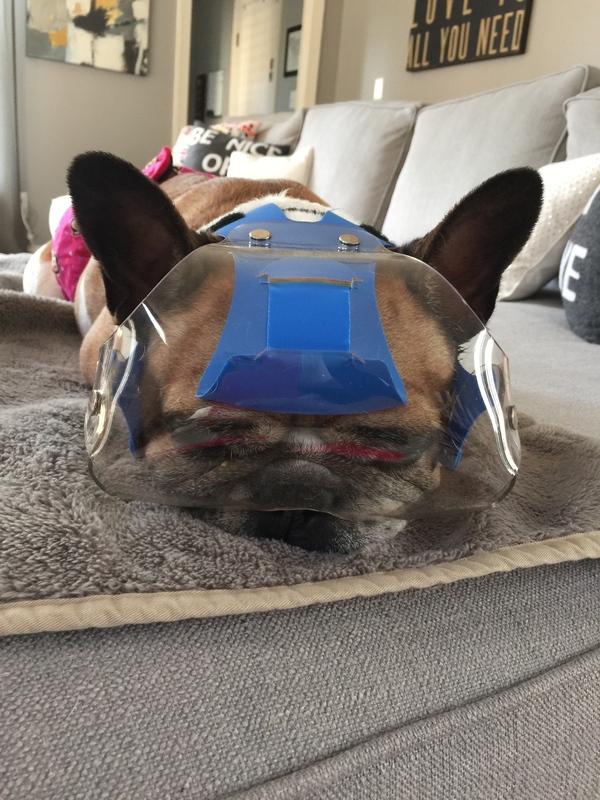 One of our awesome readers suggested we try this mask thing for Jake It’s much lighter than the cone and it does protect his eyes. The problem is that Jake is flat faced and even though we ordered the flat-faced version, he is too flat faced for even that. So he can wear this while I’m home but he has to still wear the cone when I’m not home and at night. But giving his back any break is a good thing, so we are pretty excited to present to you, the newest Power Ranger! You can still see his hamburger eye, through his Power Ranger mask. PS. His eye is not healing very quickly. The graft is taking but it’s still ‘too thick’ so we have a whole new set of eye drops. I would say more on that but I am trying to curse less. Sorry for the lack of updates — last week stunk! Jake’s eye is not healing as fast as they’d like. At the appointment on Thursday they said it might always stay like this — like raw hamburger meat slapped across his eyeball. His eye drops were supposed to get cut back but they did not, so I’m still relying on a spreadsheet. Ironically, Jake’s eyes do not produce tears but mine produce plenty! 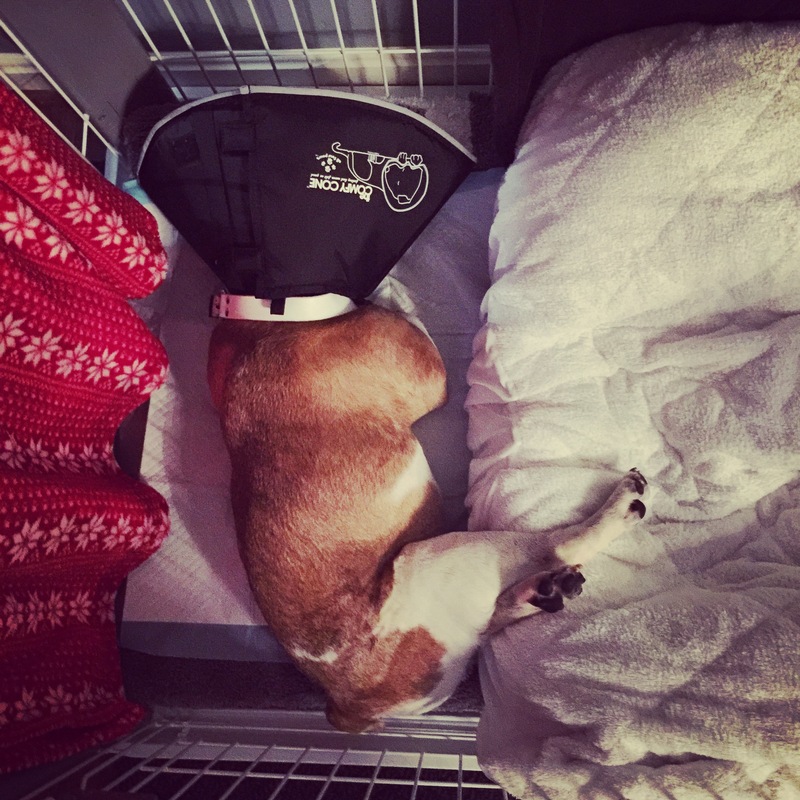 He is still in the cone. We are going on week four. To help protect his neck I cut up a pair of yoga pants and made liners for under his neck. It works great although I should not have used black pants — it makes him look like he is in ISIS. AND his ear infection refuses to heal so we are trying a new set of drops for that. My mom had (planned) surgery, she’s doing good. Then I got a two-day migraine. That gets your caught up! On a completely unrelated note to any of the above. I have a really big SUV. 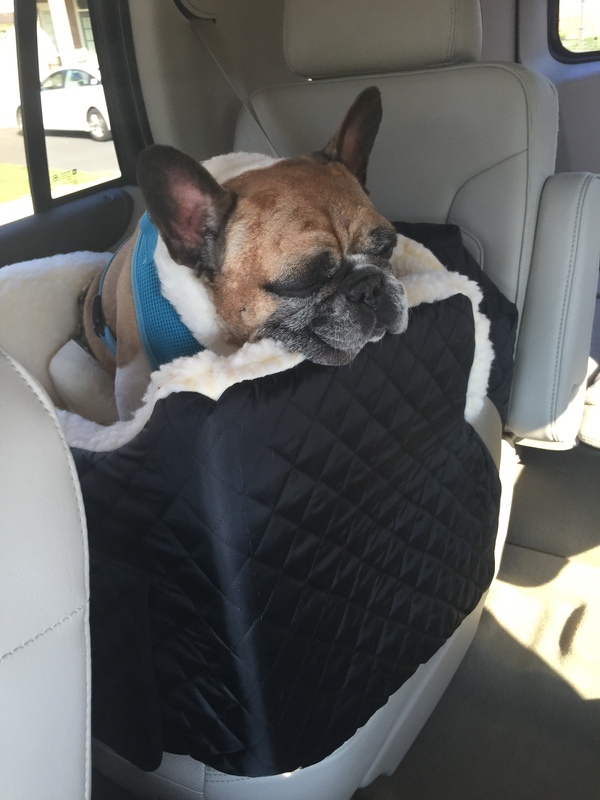 I actually ordered it for Melvin (because my last SUV was too small for him, it was too tight for him to jump into and he didn’t fit in any of the seats (with Jake) or in the back with the seats folded down -he had to hunch over). Melvin died one week before it came in. The universe writes strange poetry. Anyway, there is a big SUV parked in the driveway so I like to be a bit balanced on the green front. I’m constantly looking for ways to tip that balance. Last week I realized that our biggest crime against the environment might not even be the gas guzzler (especially since I work from home), it is likely Jake’s maxi-pad addiction count for his diapers. I mean between the giant SUV and my male dogs maxi-pads, well if fire winds start blowing, you can blame us. So we are TRYING cloth diaper pads. I don’t have kids so I had no idea what options were out there but Amazon knows everything and they served up some charcoal, anti-bacterial pads that claim they can handle a lot of liquid and keep skin dry so we shall see. 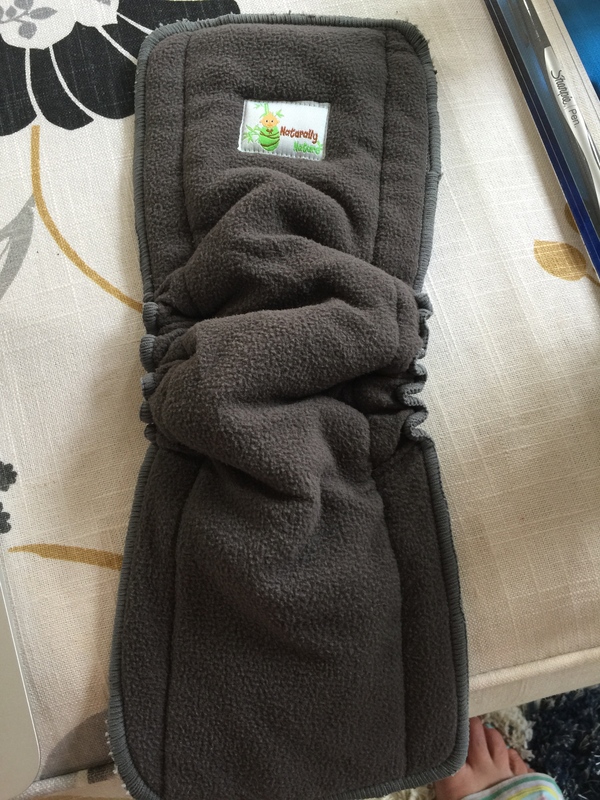 They are like a giant pad, there is no adhesive so I just place one inside our awesome belly bands and velcro tight. I wash so many loads of laundry for Jake every day (bedding, diapers, blankets) that I cannot imagine these will make a difference in that respect. We shall see. So you are all caught up! My new full time job is eye drops, Jake dresses like a terrorist, cloth diapers make their debut. Hope everyone is having a wonderful Monday so far! We’ll be picking our August Melvin’s Project Joy winner this week – yay!!!! Cloth diaper liner. 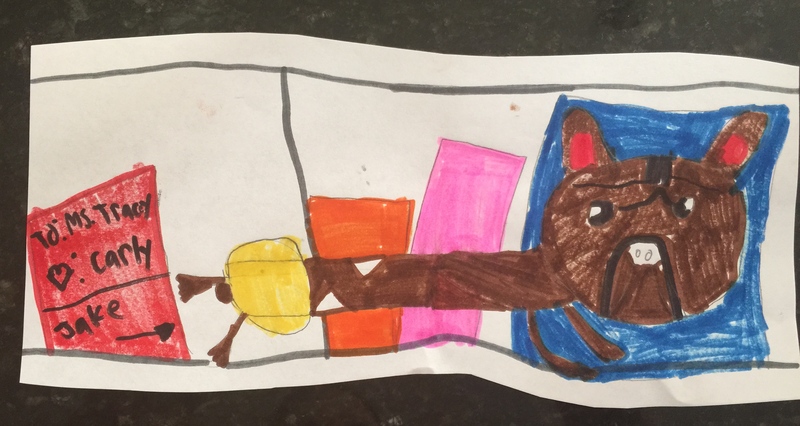 A drawing of Jake from the talented Carly! 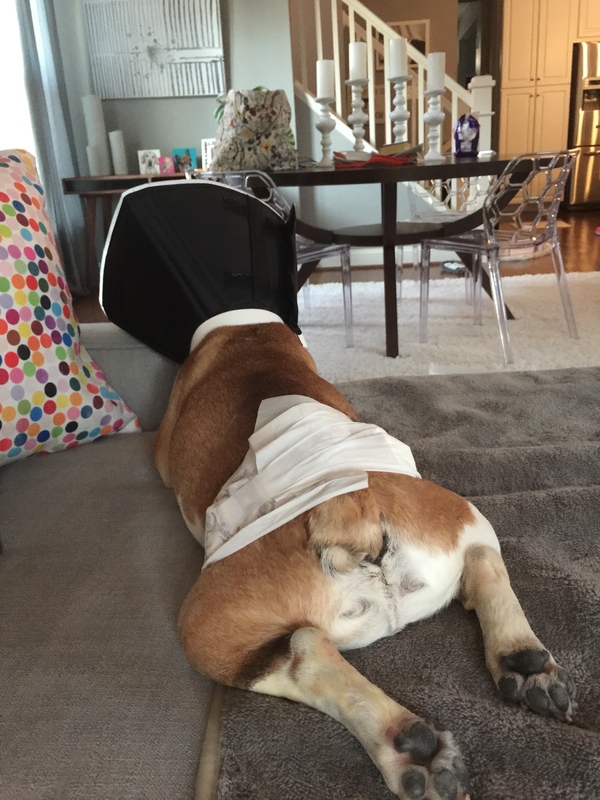 He even has his diaper on! It’s like his body is trying to distance itself from the pee and his eyes! 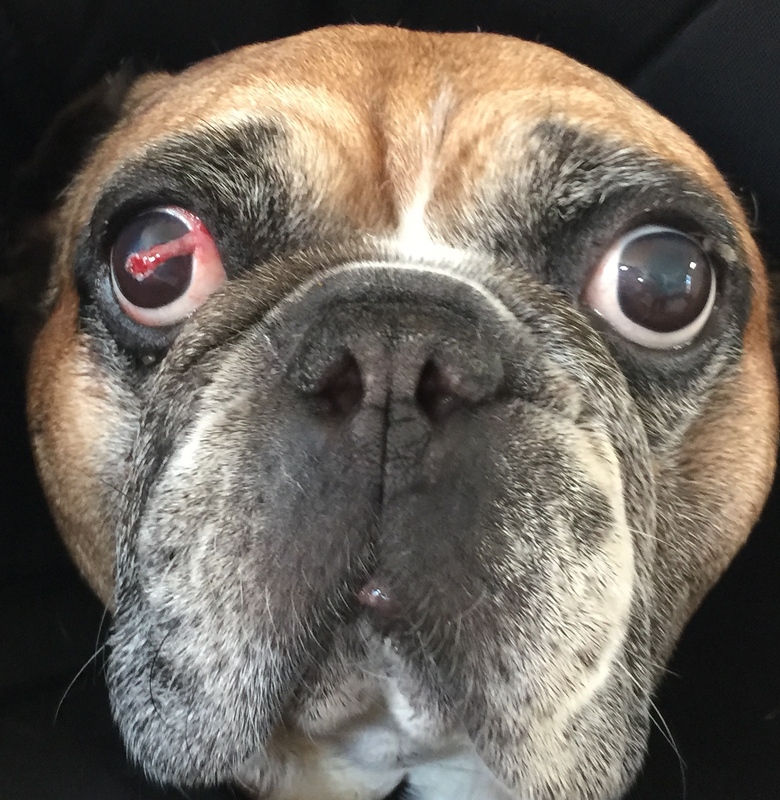 Off to the vet with hamburger eye, it’s what’s we do! (PS. he is locked into the seatbelt clip — safety always!) Jake? Are you wearing a black hood? It was a long, way too quiet (no seriously, Jake snores so loudly that now I can’t sleep without his fog horn) night without Jake. It made me additionally miss Melvin. The ophthalmologist came in early Monday, just to see Jake and she and I talked around 8am. Even though it was a phone call, I immediately loved her and felt at ease that she’d be doing the surgery. 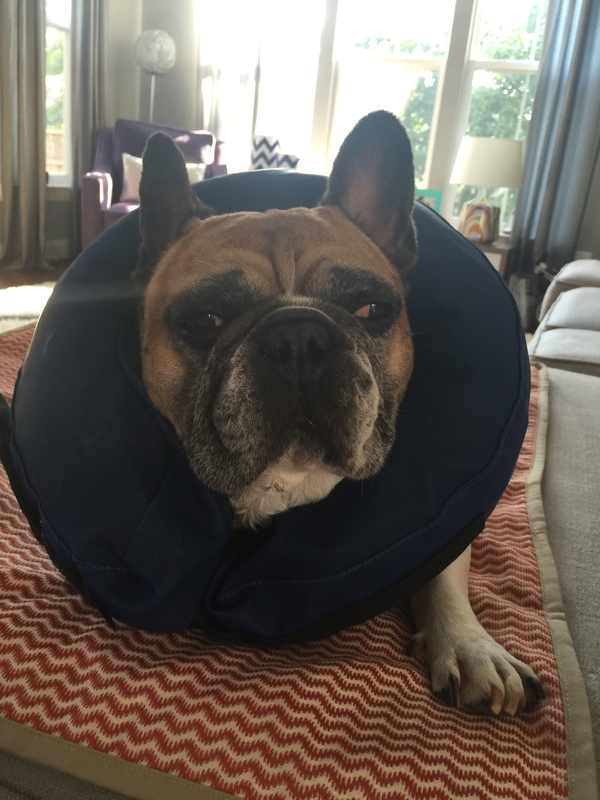 There are a few surgeries to fix ulcer issues but Jake required the most extensive one. 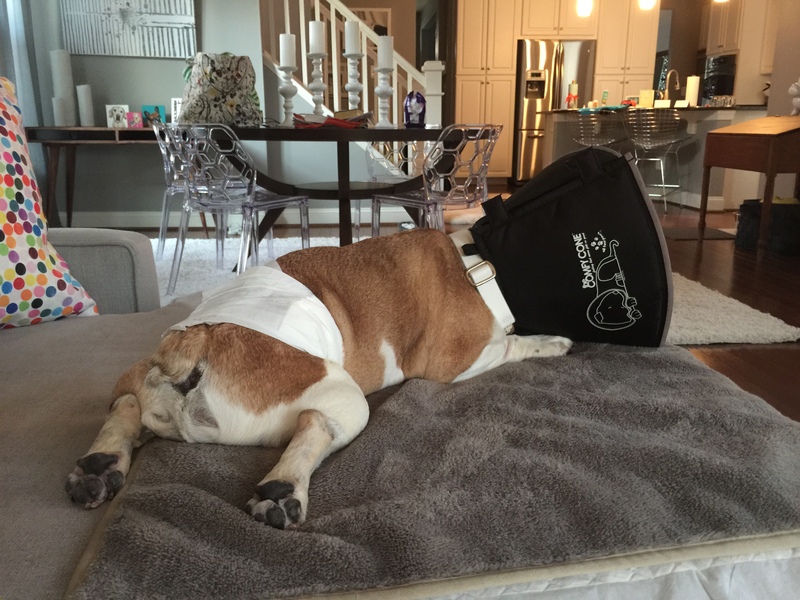 While other surgeries had a 50% success rate, his had a 95% success rate (that they’d repair the ulcer and repair and fill the hole in the center of his eye before rupture). While he was under, she was also going to remove a growth from his other eye via laser. The surgery went well and I went to pick Jake up around 4pm. DUDE WAS HIGH. He couldn’t walk (worse than usual) and his eye was really freaky. So freaky it gave me chills. We headed home with instructions for all (so, so many) eye drops, that had to be given all day long, 5 min apart (I had to do a spreadsheet) and pain meds. I also found out that a compounding pharmacy in NJ was making ‘Jake tears’. Not only did they make them the day of his surgery, they arrived at my door (in VA) the next morning. Giving Jake eye drops is excruciating. He wiggles and locks his eyelids shut and when you have a bionic eye surgery underneath the lid, you cannot put much pressure. The amount of trepidation I have when it’s time to give drops is rivaled only by the frustration I feel as he tries to flail his body off the cliff (the couch). There may or may not have been moments I’ve had to walk outside and scream so that I don’t implode in front of him. The day we had our first follow-up appointment, Jake’s eye started bleeding. Just like in True Blood. The bad news is, it’s as terrible as it sounds. The good news is that, it’s good news. 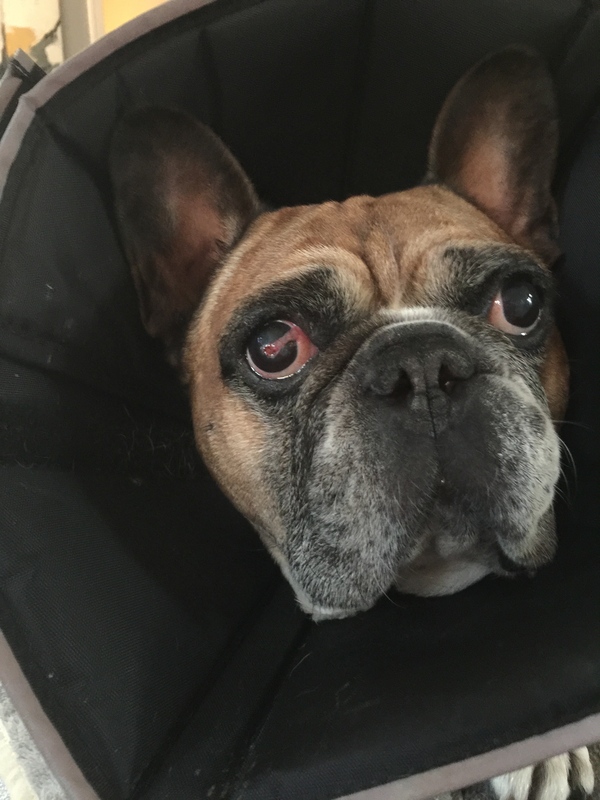 Jake had tissue transplanted into his eye – to fill the hole and stitched (yes, there are stitches in his eyeball) across his eye. The tissue was connected to blood vessels. The bleeding means the tissue is alive and there is blood flow. Everyday I have a hard time convincing myself it’s good. Up to now, bleeding has always been bad. So eyeball blood being good…so strange! 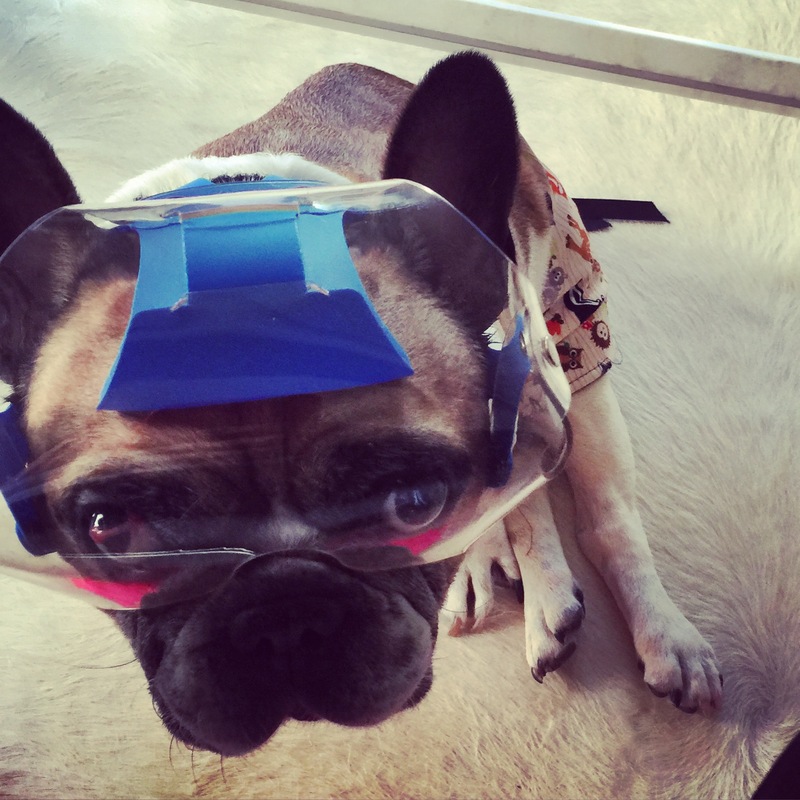 I’m amazed that animal ophthalmology is so cutting edge and so grateful that they saved his eye. We are so blessed. Here are some photos of the patient and his eye (look away if you get grossed out easy). Also, a few days into eye-magedon, Jake got an ear infection that caused him to howl in agony. My response was to scream ‘ENOUGH’ at the universe. Enough. So far, the universe seems to have heard me. Sometimes when I talk to him he is not even looking in my direction. 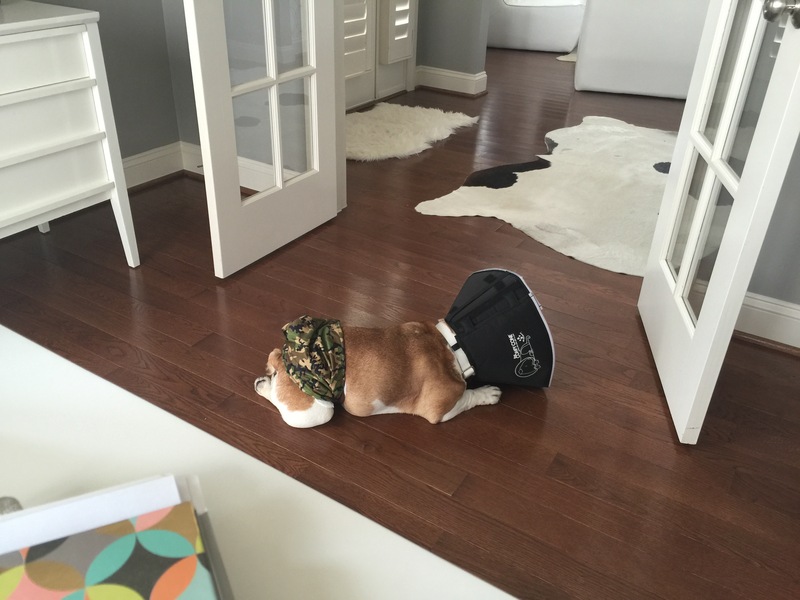 Also, he can barely walk cause the cone is too heavy for his back legs to balance out. He flops over his bed very dramatically every night. 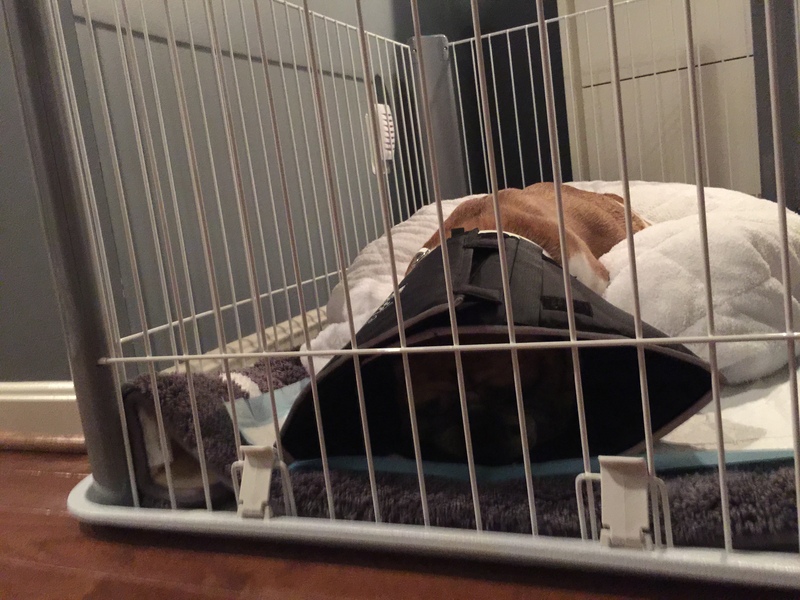 I put blankets up so that all the walls are soft and he moves them open (like curtains) with his cone head. Jake sleeps in the jail so he can be diaper free at night (junks gotta air out) and because pain-meds-Jake wanders. And here is his eye. That dot in the middle is where the hole was (that is now filled up with tissue). The flap that goes across is connected to the white part of his eye. In the second photo, you can see the active bleeding. (go ahead and gag, i do). Melvin’s Project Joy: Giveaway Two! As a reminder, each month, we will do a giveaway that celebrates the unique nature of our furry friends. There will be monthly categories, so if you have a dog that falls into that one, you can nominate them to win. If your dog does not fit into this month’s category, do not fret, we have a pretty all-encompassing list for the entire year – like if your dog is a cat – we eventually got you covered! Dogs with less than four legs! This goes beyond just a giveaway (but yes, there is of course some loot!). Our goal is to remind each other that we are all in this crazy life together. That through these giveaways, we can all bring empathy into play. 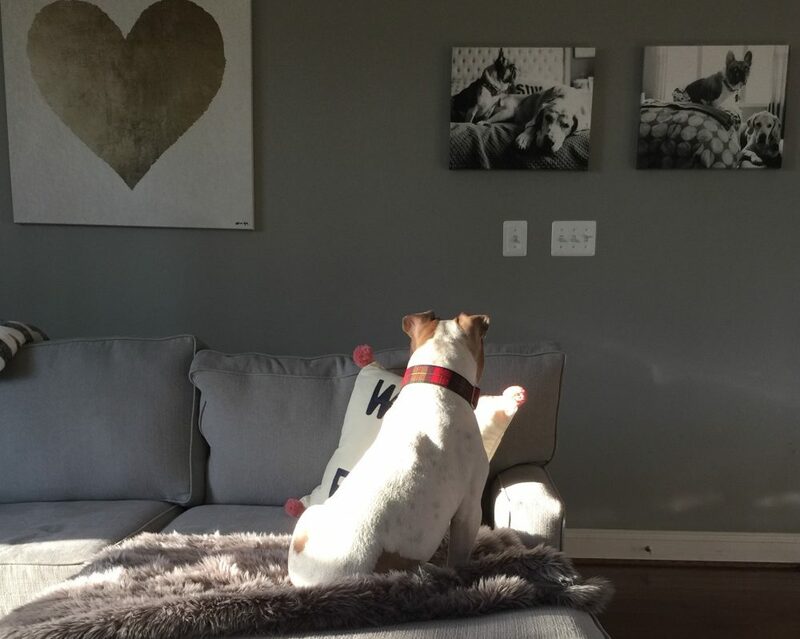 As you share stories of your dogs-with-fewer-legs, read the stories of others. You may nod, and realize you are not alone. You can message others and share your experiences and advice. Friendships will form. Support can be shared. Joy will be spread! Share your dogs-with-fewer-legs (your dog’s name, a photo. and the story how the leg count came to be) on either our Facebook page containing this post, on Sirius Republic’s Facebook page when they share this post. If you are not of the Facebook world, you can email your info to ohmelvinyojake@gmail.com. You can also post the info below in the comments, although you probably can’t share a photo on here (and that’s ok). No matter how you submit your info, you will be entered to win. We will pick one female and one male winner at the end of August! Jake went to the vet on Tuesday. He goes monthly (sometimes more). He got a bath, a legs check, a look at a rash (staph (diaper issue), got antibiotics), blood work and a look over. Eyes, ears, heart, etc. Wednesday I noticed his eyes were bloodshot. This is not a new thing except his eyes are usually only bloodshot when he is stressed, which he was not. 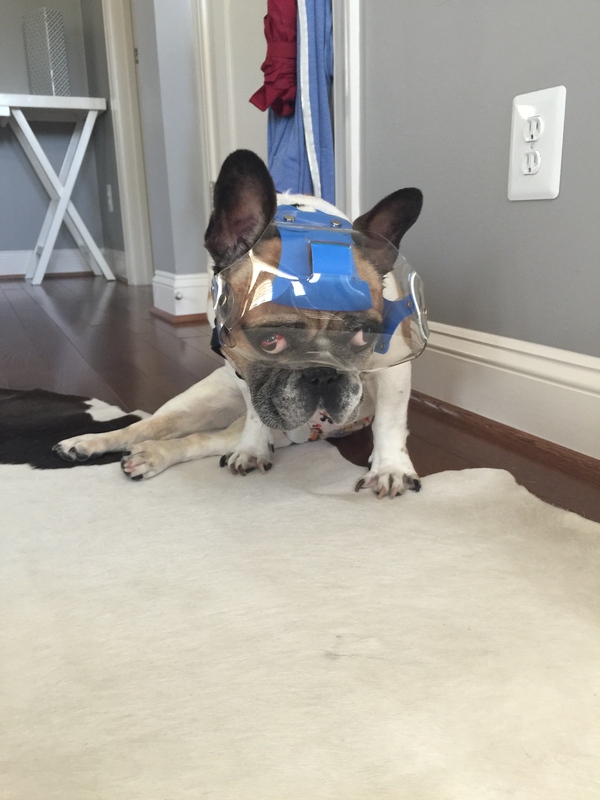 Luckily, we had his therapist (laser therapy and B12 acupuncture) coming at noon. I asked her to look at his eyes. She looked and said, he needs to go to the vet right away. He has an ulcer and it’s big. It’s an emergency. Yep, sounds about right. When you love your vet, you are willing to drive 45 min one way. When you love your dog, you will do this day after day if need be. His eyes were fine on Tuesday, I spoke to the vet that saw him (not our normal vet) and on Wednesday he had an ulcer in each eye, and one was very deep. He also had edema and vascularization. How does this happen overnight? We have eye drops and a cone. He goes back on Saturday. If the ulcers change at all or grow or start oozing liquid, we are to go to the ER vet immediately for emergency surgery. He could lose an eye over this. When I was told Melvin would lose his tail, I was heartbroken. His wildly wagging tail was the barometer of his unending joy. That tail defined his purpose. It had become a visual I counted on. (Not to mention I was convinced he would not be able to communicate in the dog world or that by not having it, he’d miss out somehow). But then I realized, his nubbin wagged and that even if it didn’t, his joy was palpable. Tails are sometimes overrated. Eyes are not overrated. I do not want Jake to lose more than he has already loss. Partly because his googly eyes are something I stare into daily and they connect us in a way that I can’t explain. But mostly because he has enough challenges, and I am still pretty sure he can see Melvin with his magical eyes. But if he does lose it, if this does not go in our favor, we will figure it out. It is what we do. Poor thing is in pain. 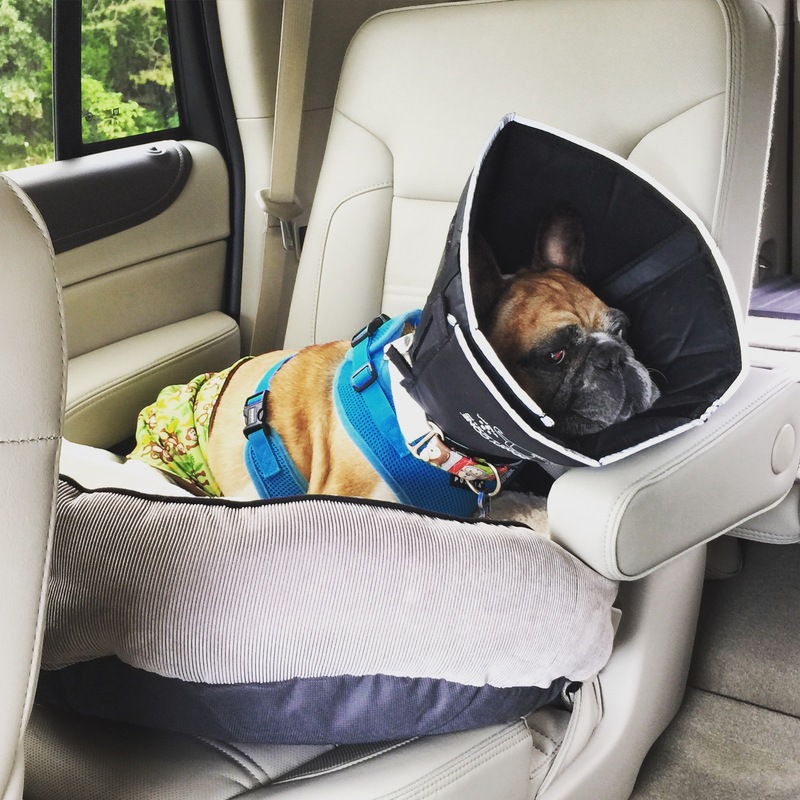 He can barely walk on his own let alone with a cone weighing him down. He’s the most ‘special’ dog I have ever seen. He fell asleep sitting up. Rough day. Is anyone shocked that I have a cone collection for ‘just in case’? He got to sleep with mom last night. I put down 45,000 blankets to catch pee and meatballs. He flopped down like that pretty dramatically after his eye drops. Giving Jake eye drops is like wrestling an alligator with your hands and legs tied behind you. 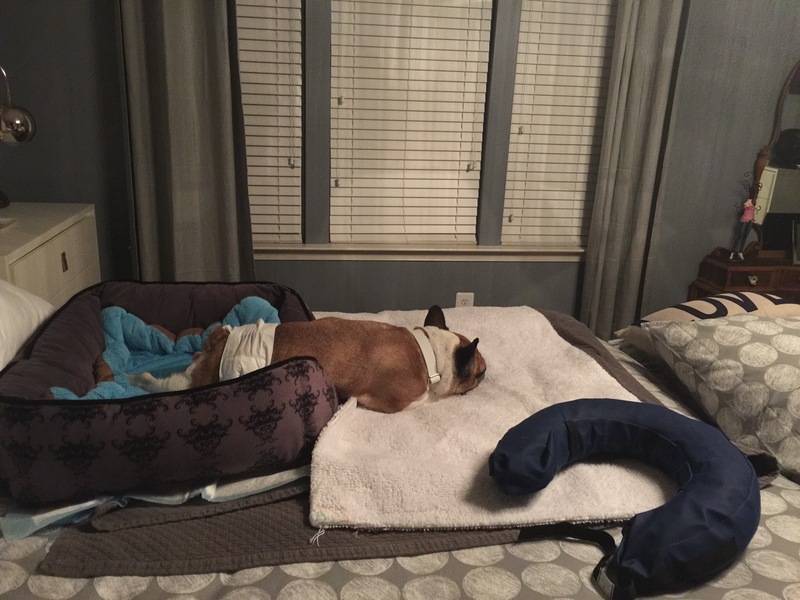 I also had to put a diaper on him just to do eye drops because he tried to pee on me. True love. Today is not much happier.